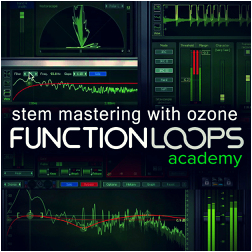 Stem Mastering with Ozone from Function Loops Academy delivers basic mastering course for electronic music producers. Tired of waiting for mastering studios to deliver the job in time? Want to quickly master your tracks to test on the dancefloor? Then take the course. You will learn about everything: preparing the stems, working with reference, finding the problems, fattening and widening everything up, adding harmonics, using Maximizer, Limiter, EQ, Reverb, Harmonic Exciter, Stereo Imager, Compressor and more useful tricks and tips. This course is a best way to start getting into mastering your own and your friend's stuff + saves a bunch of time and money. Mastering - all in one place (don't need to waste time on Youtube). The course is downloadable instantly, after purchase. We tried to cover the most ground in these videos to give you basic knowledge, but also some very in-depth, advance tips and tricks, that you must absolutely know, if you want to master electronic music. We hope you enjoy the course. You can send us comments and your music for review, we might give some tips and help you further in your path.